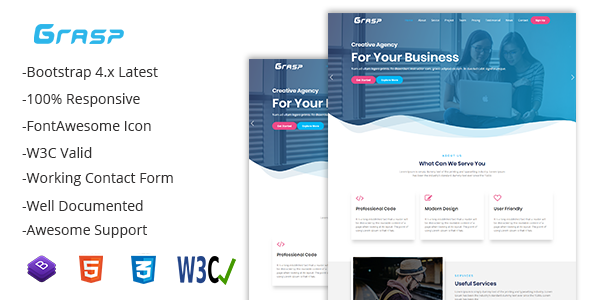 Grasp in One page Business Template based on Bootstrap 4 framework. This template suitable for any business startups companies.It’s clean coded, simple and elegant template with 100% W3C validated. This template created for Business, Agency, Studio, Corporate,Technology websites.The template gives many possibilities and can be used by everyone, also it's very easy to customization. All files and code has been well organized and nicely commented for easy to customize. It’s a 100% responsive and it works nicely on smartphones, tablet & Desktops.Our mission is to provide creative design and 100% user-friendly template.